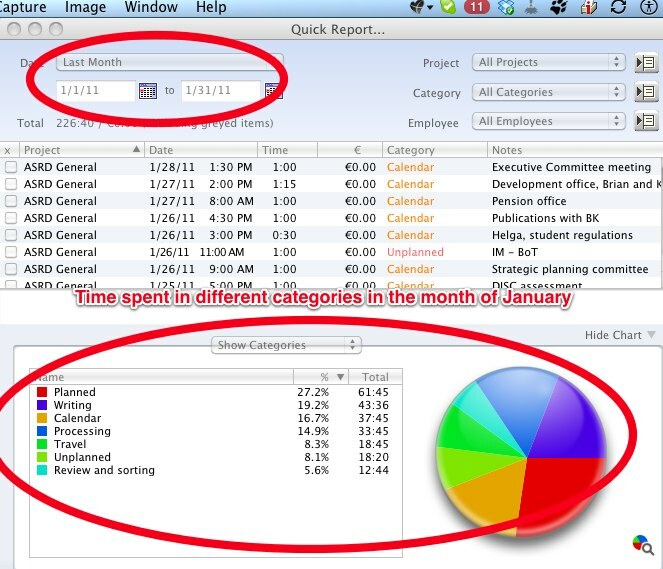 OfficeTime allows you to track time spent on various projects. There is certain logic and temptation to make OfficeTime projects correspond to projects in the GTD sense (i.e. a sequence of more than one action leading to an outcome). This is, however, impractical. I have over 50 active GTD projects in OmniFocus and I find tracking time for all or even the majority of them impossible. Sometimes you would need to know how much time is spent on a specific “GTD” project, for example, for formal reporting processes. In this case it makes sense to set up and track such a project in OfficeTime. In my case, a major aim of tracking time by project is to assure a balance between teaching, administration and research: my three main responsibilities. Thus, my projects are categorized in these three areas . There are only 3-5 OfficeTime projects in each area, thus I only track 12 professional OfficeTime projects (as opposed to over 50 active and some 70 on hold projects in OmniFocus). OfficeTime allows you to insert “Separators” in its menus to see such project grouping. For example, my Teaching area contains MSc and PhD teaching as separate projects; my Research area contains various research projects. One of my projects is called “Organizing” and is designated for professional activities which do not fit into any of the projects (e.g. responding to emails, planning, weekly reviews etc.). OfficeTime also allows assigning a category to each entry. At first I was not sure what to do with categories, but then I found a very helpful way to use them. This resulted from reflecting on how I spend my time, more specifically from frustration of being constantly disrupted or sitting in various meetings and not being able to do my work. So I asked myself a question: how much time do I spend in meetings? how much time do I spend answering email? how much time do I spend actually doing something I have planned to do in advance? how much time do I spend writing? In fact, these questions were inspired by the “First Things First” book by Stephen Covey I read around 2004. It encouraged to separate all activities into 4 groups or “quadrants”: Q1 = urgent and important; Q2 = important but not urgent; Q3 = urgent but not important; and Q4 = non-urgent and non-important. Covey argued that effective people and organizations should spend at least 25% of their time in Q2. I tried to use his system a while ago and it helped in some aspects, but I also had many questions unanswered. For example, is answering email Q1, Q2 or Q3? “Writing” – This is of course of special importance to academics and deserves tracking. In a sense it is similar to “Planned” but requires even more concentration, special contexts and persistence.